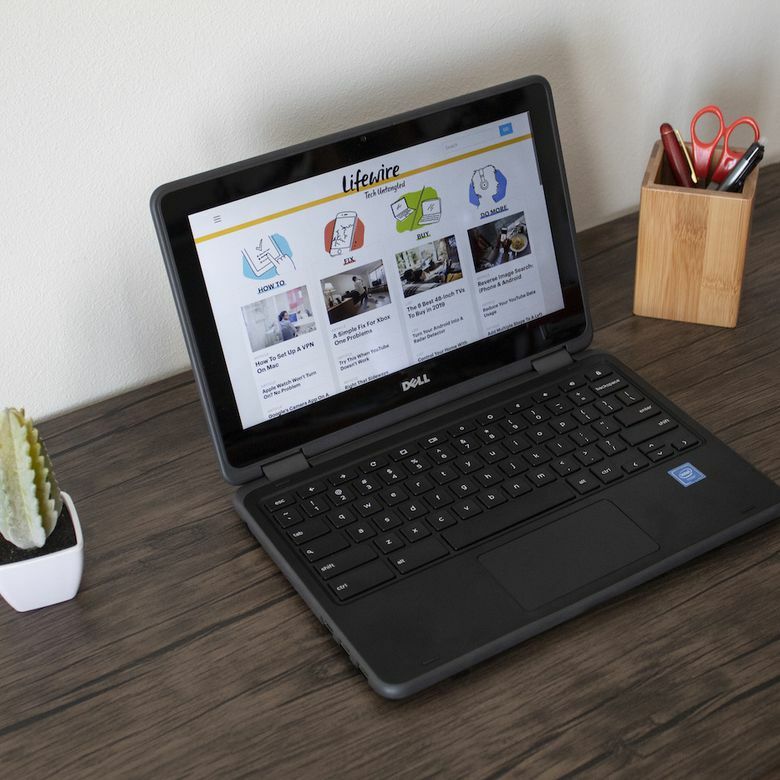 The Dell Inspiron Chromebook 11 3181 has a chunky, durable design and excellent battery life, making it a solid choice for students. The Dell Inspiron Chromebook 11 3181 is a 2-in-1 device, which means you can use it as either a laptop or a tablet. The chunky, durable design and excellent battery life make it a good choice for students, especially since it’s a fairly affordable device. That said, there a couple of downsides like a dated design and poor visibility in direct sunlight which may not make it the best tablet. To get a better idea of exactly how well Dell’s 11-inch 2-in-1 Chromebook works in real-world scenarios, we recently tested one out both around the office and at home. Weighing in at a little over three pounds, the 3181 is light enough to carry around all day, and sturdy enough to throw into a backpack or bag without worrying about it breaking. The hinges feel beefy and easily hold the screen at any angle, including folded all the way back into tablet mode. However, it does feel a little heavy to use as a tablet for anything other than occasional use. Small children may have trouble holding it for extended periods of time, even though the chunky nature of the device makes it well suited to use by small hands. The 3181 is fully capable of going an entire school or workday without needing a charge. In terms of ports, the 3181 covers the basics. First, you get two standard USB ports. It’s important to note that while both USB ports are black, rather than the blue most commonly associated with USB 3.0 and 3.1, the ports actually are the faster USB 3.1 ports. You also get a full-sized HDMI port, which is a nice touch on such a small Chromebook. The included memory card reader only accepts micro SD cards, so your full-sized SD cards won’t fit. If you want to listen to some music, or a YouTube video, without disturbing anyone around you, it also includes a standard headphone jack. Since the 3181 is a Chromebook, setup is extremely fast and easy. In most cases, you’ll actually spend more time getting the device out of the box and plugged in than you will setting it up. From the moment you turn it on, it takes less than two minutes to reach a point where the device is ready to use. Setup does involve signing into a Google account, so if you don’t already have one, that does add an extra wrinkle. You’ll also need to know your Wi-Fi SSID and password, because the setup process requires you to log into your Wi-Fi network. That’s all standard operating procedure for Chromebooks though, since they’re designed primarily for use with a Google account and an internet connection. While the 3181 is ready to use immediately on booting up the first time, you will have to download a system update that will install the first time you restart the device. You’ll also have to install any apps you require, because it only comes with the very basics pre-installed. The 3181 features an IPS display, which is a nice touch and a definite step up over competitors with lower quality TN panels. However, it probably isn’t the best IPS display you’ve ever seen. It’s decent enough for an inexpensive Chromebook, but it suffers a lot in terms of brightness. During testing near a sunny window in our office, we had trouble making anything on the screen. When taken outside on a sunny day, the picture is even grimmer. The good news is that it’s perfectly suitable for use indoors, and and it looks great in darkened rooms. The viewing angles are decent, which is key for a 2-in-1 device like this, and the color accuracy is also more than acceptable for such an affordable device. There is some backlight bleed, which becomes more apparent when the screen is viewed at extreme angles, but the picture doesn’t get overly washed out or impossible to make out. The 3181 achieved a score of 4881 in the PCMark Work 2.0 test, which is on the lower end of devices we tested with similar hardware specifications. It scored slightly higher in web browsing, and did well in both video editing and photo editing, but suffered in data manipulation and the PCMark Writing 2.0 benchmark, where it notched a score of 3581. In more practical terms, the 3181 performs well enough for most basic tasks, like web browsing, streaming video, and word processing. In our testing, the device exhibits some slowdown when loading complicated web pages, but it handles basic sites, including word processing tasks through Google Docs, without any trouble. If you need to copy and paste large sections of text, you’ll notice lag and slowdown, which is probably why it scores so low in the PCMark Writing 2.0 benchmark. Despite a decent score in PCMark’s photo editing benchmark, the 3181 actually struggles in that department. While you can open images with a site like Pixlr, anything beyond very basic manipulation, like resizing, presents a problem. Those problems are only exacerbated if you have multiple images open at once, to the point where you’ll even see noticeable input lag whether you’re using the touchpad or touchscreen input. Even though the 3181 isn’t designed for gaming, we also put it to the test with a couple tests from GFXBench. It wasn’t able to run the standard Car Chase 2.0 bench, so we submitted it to the GFXBench OpenGL Aztec Ruins High Tier test. Predictably, it didn’t do that great, only managing 9.9 FPS. It did better at the OpenGL T-Rex test, managing a respectable 34.1 FPS, but you still aren’t going to be playing any graphically demanding games. The 3181 is a 2-in-1, so you would ideally be able to use it as both a laptop replacement and a tablet replacement. Depending on the specific tasks you need to accomplish, it may fall short of both of those marks. Since the 3181 is a Chromebook, it has limited functionality as a laptop. It does have access to the Chrome Web Store, which helps a lot in terms of productivity. However, it isn’t exactly a workhorse. It’s better suited for use by a student in an educational environment, or as a highly portable supplement to a more powerful laptop, than as a direct replacement for a laptop. If all you need is basic web browsing, email, and word processing, then your productivity won’t suffer at all when using the 3181 as a laptop replacement. The keys are a little small, but well-spaced and snappy, so you shouldn’t feel too cramped or uncomfortable even if you have large hands. As a tablet, it performs well enough. The touchscreen is responsive, the viewing angles are great in both portrait and landscape mode, and it folds into tablet mode very easily. However, you may find that it’s a little heavy to hold in tablet mode for extended periods of time. It’s also a little bulky to use as a tablet, especially for children with smaller hands. The sound quality of the 3181 isn’t anything to write home about, but that’s pretty common for devices in this class. The speakers are actually fairly loud at maximum volume, although we noticed significant distortion at higher levels. They’re also extremely tinny, with very little bass response. The stereo speakers are located toward the front of the device, and they fire downwards. Despite having visible grills, and not being blocked physically, they also sound somewhat muffled at all volume levels. Whether you’re listening to music, or streaming movies, you’re better off taking advantage of the audio jack and plugging in a nice set of headphones. Network connectivity is limited to Wi-Fi, as there is no ethernet port. In terms of speed, the 3181 was able to achieve a transfer rate of 149 Mbps down and 60 Mbps up when in close proximity to our router, and those speeds were not adversely affected by moving the device to the other side of our office. At a distance of about 50 feet, with two walls in the way, the Wi-Fi signal dropped by about 25 percent. The touchscreen is responsive, the viewing angles are great in both portrait and landscape mode, and it folds into tablet mode very easily. In comparison, a desktop computer connected to our network via Wi-Fi achieved speeds of 165 Mbps down and 68 Mbps up during the same timeframe that we were testing the 3181. Slightly higher speeds of 245 Mbps down and 70 Mbps up were achieved via a wired ethernet connection at that time. The built-in webcam is sufficient for personal use, but we wouldn’t recommend using it for professional video conferencing. The picture is sharp enough and looks fine in a well-lit room, but the color reproduction isn’t very good. Shadows are also very dark, while brighter areas, especially when natural sunlight is involved, seem blown out. When recording video, the camera focuses just fine, and it handles movement without too much blur. However, movement results in noticeable artifacting that seems to be caused by the camera struggling to handle changing levels of light. If the 3181 shines in any area, it’s battery life. We subjected it to PCMark’s Work 2.0 battery test, and it lasted for over nine hours under constant load. In more general daily use, including web browsing, word processing, and video streaming, interspersed with periods of inactivity, we found that it can go upwards of 13 hours between charges. The 3181 is fully capable of going an entire school or workday without needing a charge. With battery performance like that, you might even get away with leaving the charger at home. The 3181 is a Chromebook, so it comes with Chrome OS. If you aren’t familiar, Chrome OS is a stripped down operating system that’s a whole lot simpler than either Windows or Mac OS. It started out as little more than a web browser with some additional features, but it has grown into a lot more over the years. Some Chromebooks, including the 3181, provide you with access to the Chrome Web Store, and compatibility with Android apps. That means you can install just about any Android app on the 3181, which can really help with productivity if there are any Android apps that you really need for school or work. Chrome OS also gives you the option to dual boot your favorite flavor of Linux, if you’re more technologically minded, which expands your options even further in terms of the kind of software that you can run. The 3181 is priced at an MSRP of $279.99 for the basic configuration, and $299.99 for the most expensive version. That puts it right in the middle of the road for similarly equipped Chromebooks. That means you have a lot of options if you prefer a Chromebook that looks a little nicer, or offers slightly better performance. The 3181 is light enough to carry around all day, and sturdy enough to throw into a backpack or bag without worrying about it breaking. If you want a slightly ruggedized Chromebook, and you aren’t bothered by the appearance or weight of the device, then it’s a good choice at this price. If you don’t need the tablet functionality, then you can save a bunch of money going with a standard laptop form factor. The 3181 compares favorably to the competition in some respects, and falls short in others. In terms of durability, the rubber bumper that surrounds the base and lid help make it a lot more durable than Acer’s comparable R11 Chromebook model, or the slightly more expensive Asus Chromebook Flip C101. In terms of visual flair, the 3181 comes up short in comparison to both the Acer R11 and the Asus C101. The plastic-and-rubber design feels dated and cheap compared to the all-metal body of the Asus C101, and it even looks like something of a child’s toy compared to the also plastic, yet more stylish, Acer R11. The 3181 is also a lot heavier than competing models, tipping the scales at 3.17 pounds. The C101 weighs in at about 2 pounds, the R11 at 2.76 pounds, and both are noticeably lighter in the hand. It might not seem like much, but you really notice it when using the devices in tablet mode. The 3181 does have better battery life than either the R11 or C101, so it really is a tradeoff between looks and weight versus durability and battery life. Interested in seeing other options? Read our list of the best laptops for kids on the market now. All the durability and battery power you need for a full day of schoolwork. The Dell Chromebook 11 3181 is a great little 2-in-1 if you can get past the less than stellar physical appearance and the fact that it weighs a little more than the competition. It makes an especially good choice for students, since it’s a bit more durable than competing models. Product Dimensions 11.96 x 8.18 x 0.82 in.